A game of two halves; certainly a draw of two halves in the first round of the Men’s Doubles event at the Seamaster 2018 ITTF World Tour Lion Japan Open in Kitakyushu on Friday 8th June. 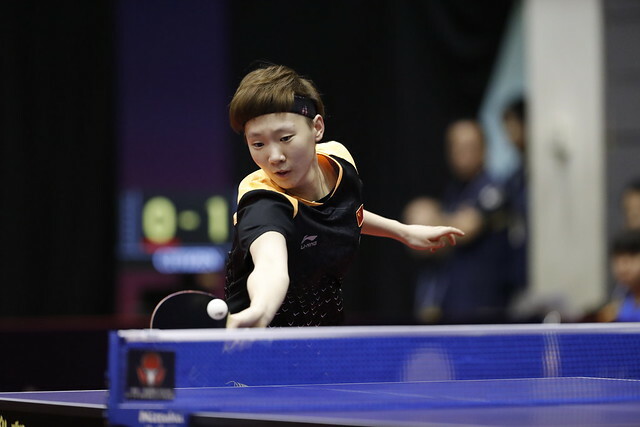 In the top half all four seeds prevailed, in the lower half just one; that of the host nation’s Tomokazu Harimoto and Yuto Kizukuri, the no.4 seeds but only just. They had to recover from a two games to nil deficit to end the hopes of the European combination formed by Sweden’s Anton Källberg and Slovakia’s Lubomir Pistej (8-11, 10-12, 11-5, 11-6, 11-6). Success for Tomokazu Harimoto and Yuto Kizukuri but not for their colleagues, Jin Ueda and Maharu Yoshimura; they emerged the biggest casualty of the round. Winners on three occasions on the ITTF World Tour, the no.2 seeds, they were beaten in closely contested five games duel by the German combination of Benedikt Duda and Qiu Dang (11-9, 7-11, 11-9, 5-11, 11-9). Similarly, Sweden’s Kristian Karlsson and Mattias Karlsson, the no.5 seeds, experienced a close defeat when facing China’s Liang Jingkun and Zhou Kai (11-6, 11-5, 8-11, 8-11, 11-6). Likewise, Hong Kong’s Lam Siu Hang and Ng Pak Nam, the no.7 seeds, departed at the hands of Chinese Taipei’s Liao Cheng-Ting and Lin Yun-Ju (11-8, 8-11, 11-6, 6-11, 11-8). At the quarter-final stage Tomokazu Harimoto and Yuto Kizukuri meet Liang Jingkun and Zhou Kai; Liao Cheng-Ting and Lin Yun-Ju oppose Benedikt Duda and Qiu Dang. Meanwhile, in the opposite half of the draw matters went to plan. Hong Kong’s Ho Kwan Kit and Wong Chun Ting, the top seeds, beat Thailand’s Veerapat Puthikungasern and Purit Verakultawan (11-1, 11-2, 11-6) and now meet Chinese Taipei’s Chen Chien-An and Chuang Chih-Yuan, the no.6 seeds, also winners against Thai adversaries. They accounted for Thyme Sanglertsilpachai and Tananan Tantakool (4-11, 11-6, 11-2, 13-11). Hong Kong or Chinese Taipei; whatever the outcome, Korea Republic awaits. In the quarter-final round Jeoung Youngsik and Lee Sangsu, the no.3 seeds, meet colleagues Jang Woojin and Lim Jonghoon, the no.8 seeds. In the opening round Jeoung Youngsik and Lee Sangsu beat the combination formed by Spain’s Alvaro Robles and Romania’s Hunor Szocs (7-11, 11-8, 11-8, 11-5); Jang Woojin and Lim Jonghoon accounted for Thailand’s Yanapong Panagitgun and Supakron Pankhaoyoy (11-4, 11-5, 11-7). The quarter-finals will be played later in the day.